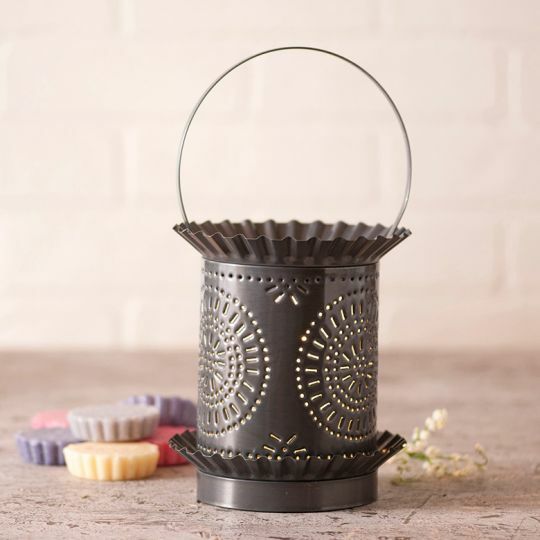 A larger alternative to our Mini Tartwarmer, this warmer can hold up to three wax scents at once! You can make your own custom scent by mixing two or more scents together....neat idea! Wired with one E12/Candelabra socket, 40 watt max. Has a 3' cord and line switch. Country Tin finish. Bulb included. Handcrafted in Pennsylvania. Measures 10.5-Inches high and 5.5-Inches diameter.